Coffee has been my go-to-drink since I first had my first cup when I was in high school. I drink coffee not just to wake me up in the morning, but also to keep my energy through the day, to complement my food, and even as a pre-workout! I drink coffee too much that my wife thinks coffee is equivalent to my water. I used to drink up to 6 to 8 cups of coffee when I was in University especially during sleepless nights of studying. Recently, I’ve been trying to reduce my coffee intake to 3 cups a day or less. It’s been my practice to brew my own coffee and bring it with me on a contigo container (or two). Brewing my own coffee saves me a lot of money compared to buying coffee every day from coffee shops. I understand love for coffee, but I don’t get how people can spend so much just from buying coffee from Tim Horton’s or Starbucks! Brewed coffee on the other hand is great for sharing and is a lot less expensive than asking other people to make pour you a cup. 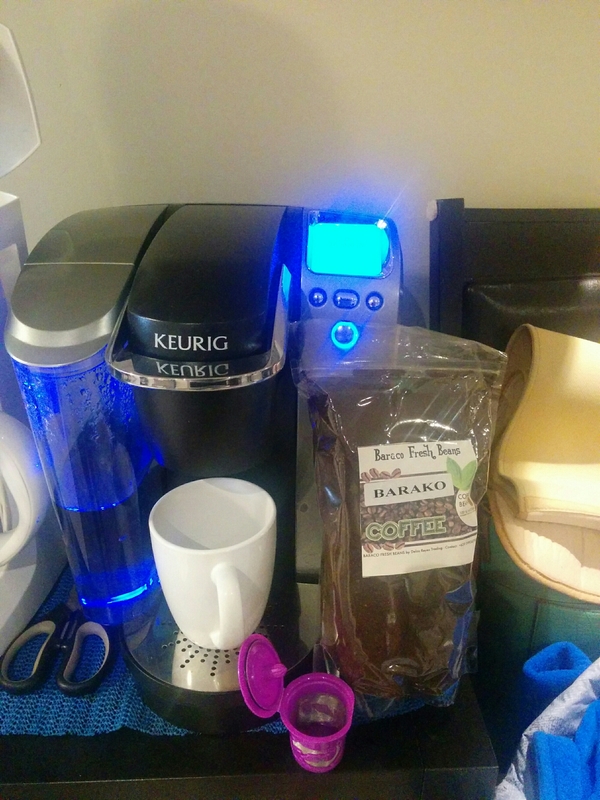 My wife and I got one of the best gifts ever a few years ago – a Keurig k 700 hot brewer. Using a Keurig coffee maker is an easier and faster way to make coffee. It’s very useful on days I’m rushed, or when I just want to indulge myself in a single serving of a special flavoured k-cup. K-cups are of course costlier than ground coffee, but it’s worth the indulgence. What I actually don’t like about the Keurig pods is that they can be wasteful – imagine how many used pods go to the garbage each day! I love coffee, but I also love to keep our mother earth alive. The solution to this dilemma is to use Reusable Keurig Cups. There are many types out there, but I think I found the best one! Of course, Keurig has its own version of reusable K-cups (you can check them out here) but the brand dictates its price. 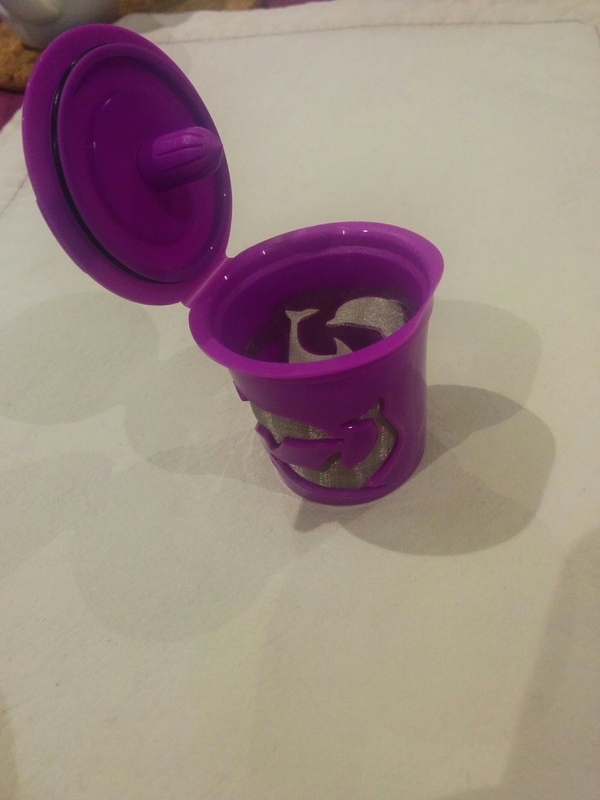 I was able to purchase functional resuable K-cups from Amazon and they work great. 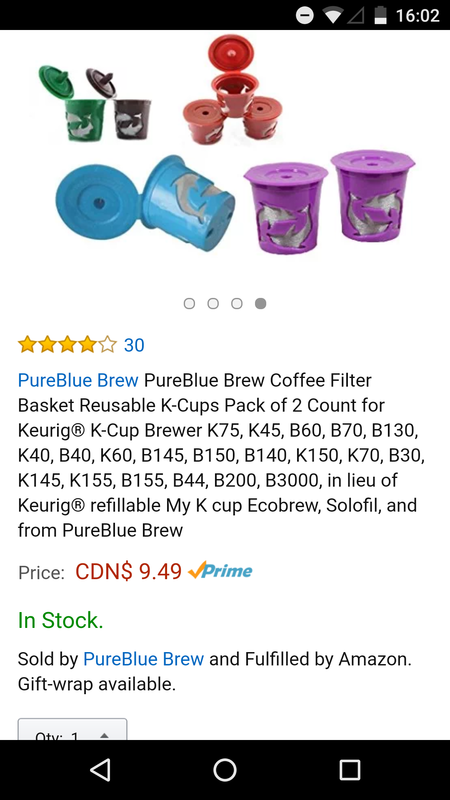 They are the “Pureblue Brew Coffee Baskets” and you can get two pieces from Amazon for only $9.49. Check them out here. Now I only buy ground coffee bags of different flavours and I can choose which one I’d like if I only want a single Keurig serving. From the picture above, you can see I enjoyed a ‘Barako coffee,’ a coffee derived from the Liberica type which is stronger, bolder, but smoother and is rare in North America. The PureBlue Brew Coffee Baskets are easy and straightforward to use: open the container and pour a generous amount of grouns coffee of your choice, lock the lid and use it like any other K-cup. Just make sure there’s no coffee ground bits left around the rim so you can close it properly. Also, you only need to fill it about 3/4ths or less, depending on how strong you want the flavour in your coffee. They are also very easy to clean: simply scoop out the used coffee from the basket to your garbage, then submerge the reusable cup in a bowl filled with soapy water to make sure there are no leftover coffee particles, wash then rinse. You can order your “PureBlue Brew Coffee Basket” by clicking this link. To more coffee cups! Enjoy! My First e-Book is out! “Exercise Essentials” A manual for beginner to intermediate exercisers, with a 6-week Strength Training Program and Cardio Guide. I have always been passionate about helping people achieve their goals to live healthier, fitter lives. I want to share my experience, time, effort, and knowledge to as many people as I can, and I have achieved this through my past and current job as a Coach, Trainer, and Owner of the Online Fitness Coaching company, “Fitness Coaching for Me.” Now I can achieve that goal through this book and reach more people all over the world! “Exercise Essentials” is the best manual for you if you are a beginner at the gym, or if you have been exercising for a while but want to level up your training! If you are a beginner to exercise, this e-book will guide you through detail about all the important things you need to know to exercise. If you have been exercising for a while already, you can still use this e-book to get your workouts to the next level! And it includes a 6-week sample workout that incorporates the principles discussed in the book. Download “Exercise Essentials” to your kindle, tablet, or smartphone and start reading so that you can reach your exercise goals Faster! If you are someone who is seeking to live a healthier lifestyle this year, this e-book is for you! Don’t worry, you don’t necessarily need to go to a gym to do the exercises included. There are ‘home exercises’ that you can do without needing to be at a gym! Of course, you can choose if you want to just start with the cardio guide, or the strength training, but you will reach your fitness goals faster if you try to do them both. If you have been working out and have reached a training plateau where you are not getting gains anymore, then it might be time to tweak your training. Read “Exercise Essentials” and see where you can make the necessary changes to your training routine, apply scientific exercise principles, and jump back to getting more gains. The best part about this e-book is that you can read it for FREE if you have Kindle Unlimited! So just get your copy now, read on, and start exercising! We had our 3rd Trainers meeting today in the gym and as usual, our Fitness Director had another gimmick to make the meeting interesting and reward his trainers in simple ways. I won a Starbucks gift card on our first meeting for being the first one to submit a document he asked us to do. 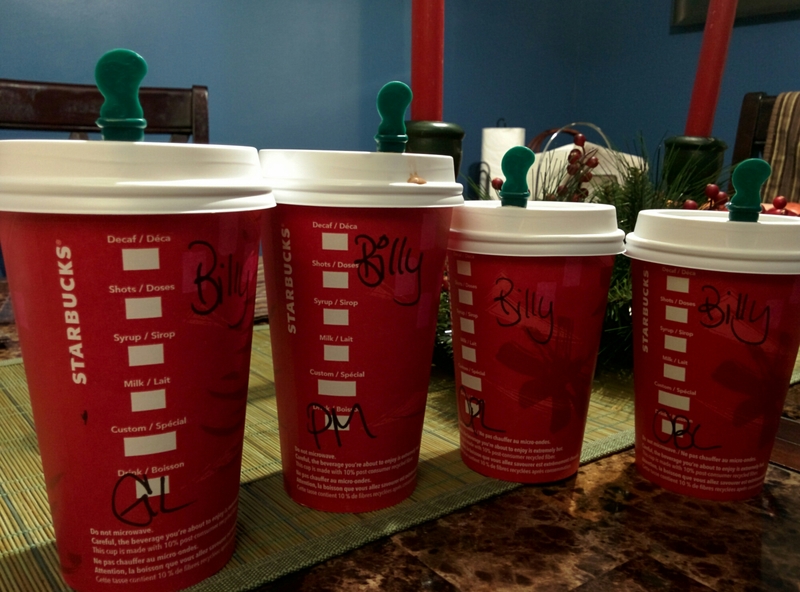 I waited for the right moment before using my Starbucks card and in the first week of November, Starbucks offered a Buy-One-Get-One deal! It was my first ever Starbucks coffee that I purchased by myself. 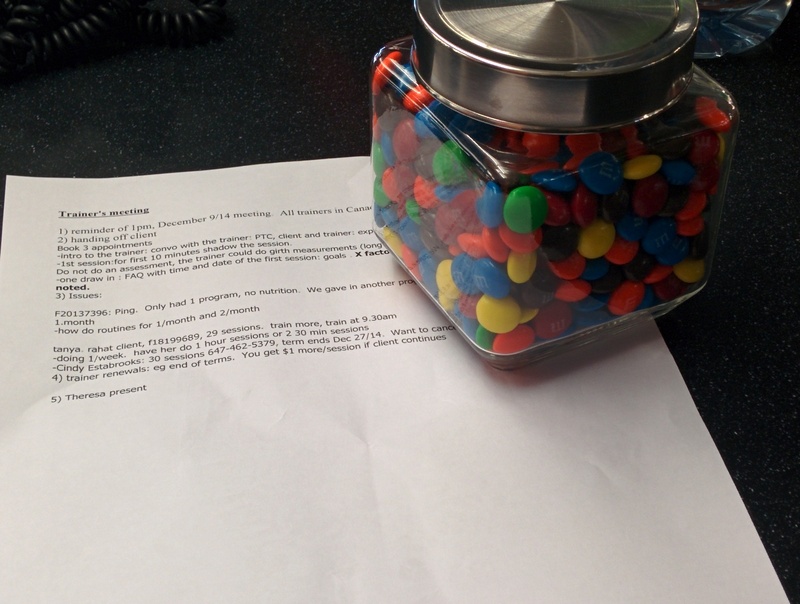 Anyway, for this meeting we were asked to guess the number of M&M’s inside a jar he got from the dollar store. 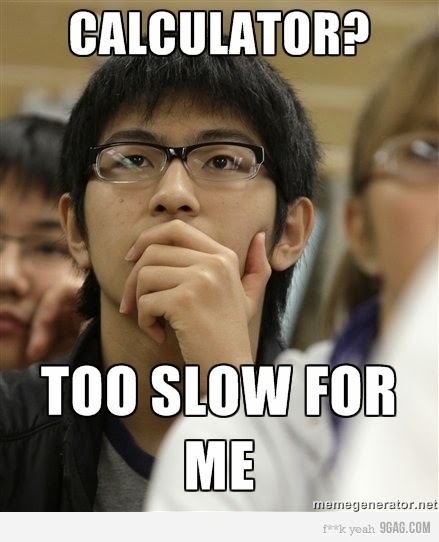 Maybe that’s his way of making us think about something – anything – during the meeting. At the end of all the discussion, he asked each one of the trainers what our guess is. One guessed as low as 260 and another guessed as high as 540. The correct answer apparently was 436. The victory was not in winning the jar of M&M’s, which most probably I won’t be enjoying, but it lies in being able to harness that long lost mathematical skill that I learned somewhere in high school. Yes kid, those weird math problems will have their practical application someday. 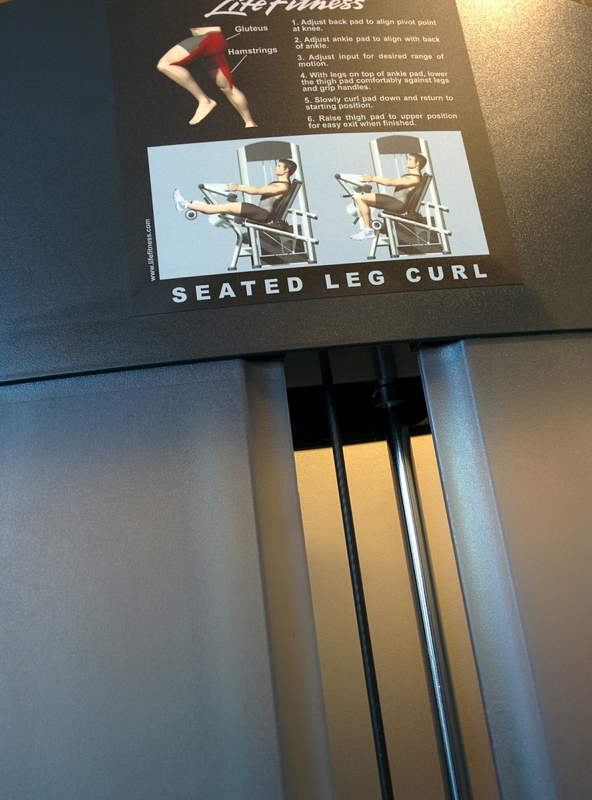 I’m on this machine today for my legs because I’m too lazy to squat (and to lunge). 3 clients cancelled for this morning so I suddenly have time to work out (and write this short post during rest periods). Maybe it’s not plain laziness, but because I’m feeling some chronic fatigue from waking up early, commuting for a total of 160minutes per day including 4km walks, and going home late to meet clients for Personal Training. Resistance machines have their value, but I usually let clients do multiple-joint and free weight exercises which are more functional. Beginners can start with weight machines until they develop a foundational muscular strength, muscular endurance, and neuromuscular control. Clients who want to build muscle also benefit from weight machines because it provides that “isolation” for a specific joint so they can focus working a muscle or muscle group. But for now I’ll stick with weight machines because having time to work out is starting to be a luxury and I’m too lazy to stack and tidy up plates.